UEFA conducted its second knockout stage tournament draw on Monday morning, as Arsenal and Chelsea learned their next opponents. Arsenal drew BATE Borisov out of Belarus while Chelsea were drawn with Zlatan Ibrahimovic 's former club Malmo in Sweden. Since both Arsenal and Chelsea were seeded, they'll travel east for the first legs and host the second legs, though they're not allowed to be hosted on the same night. Matches will take place on February 14 and February 21, with the exception of Arsenal-BATE and Sevilla-Lazio, since Real Betis, Sevilla's second club, is playing in this stage of the competition as well. 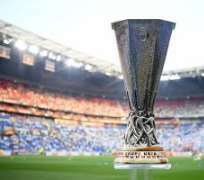 It's the second-straight season in which Arsenal and BATE will play, after the pair were placed together in the group stage of the 2017-2018 Europa League. Both Arsenal and Chelsea may have an advantage, as both the Belorussian and Swedish top divisions run from spring to winter, taking a long break from December through March due to the weather conditions.